François Flameng (1856–1923), Napoleon hunting in the forest of Fontainebleau (date not known), further details not known. Wikimedia Commons. Painters have to pay the bills too, and in the nineteenth century, with the traditional system of patronage on its way out, many of the best turned to portraiture. Those who succeeded in getting the rich and famous to queue at the door to their studio often made small fortunes. For a few artists, this enabled them to paint their own choice of themes. Today and tomorrow, I look at the contrasting work of François Flameng (1856–1923), who painted portraits for the royal families of Europe, and was one of the greatest war artists of the twentieth century. 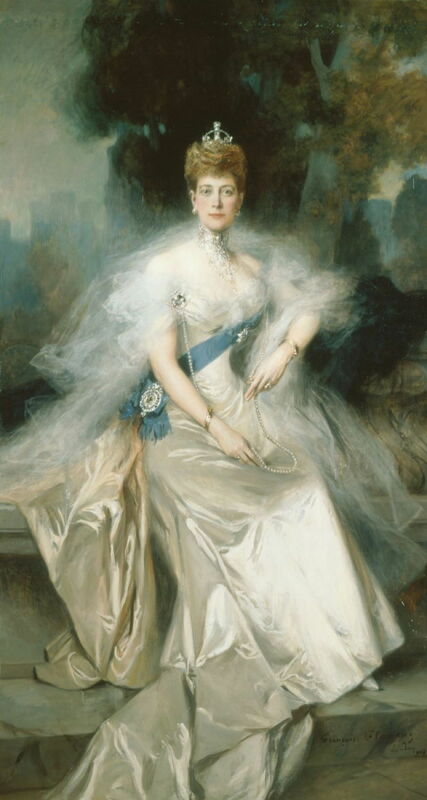 François Flameng (1856–1923), Queen Alexandra (date not known), further details not known. Wikimedia Commons. His two most famous portraits are of Queen Victoria of Britain, and Queen Alexandra, wife of Victoria’s successor King Edward VII. She sat for this portrait in the White Drawing Room of Buckingham Palace in London. 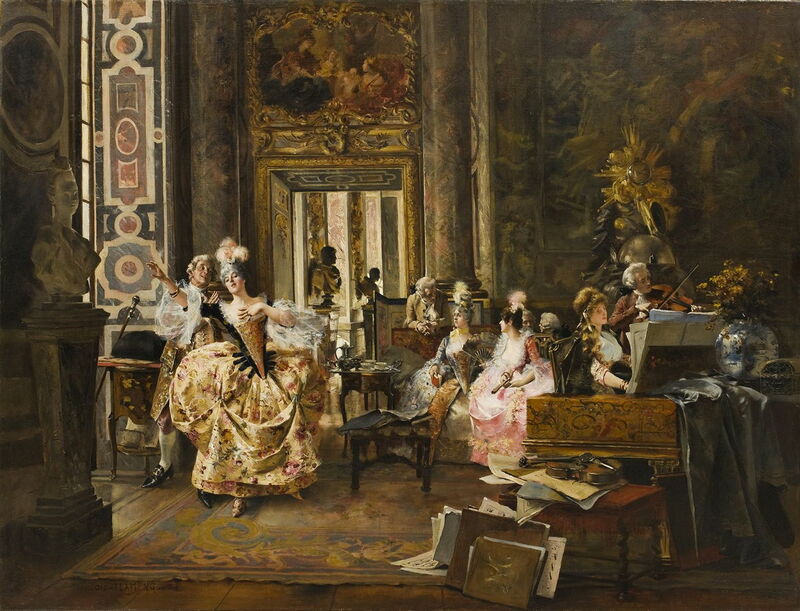 François Flameng (1856–1923), The Masséna Family Entertaining Princess d’Essling (1902-03), oil on canvas laid on the wall, dimensions not known, Villa Masséna, Nice, France. Image by Finoskov, via Wikimedia Commons. 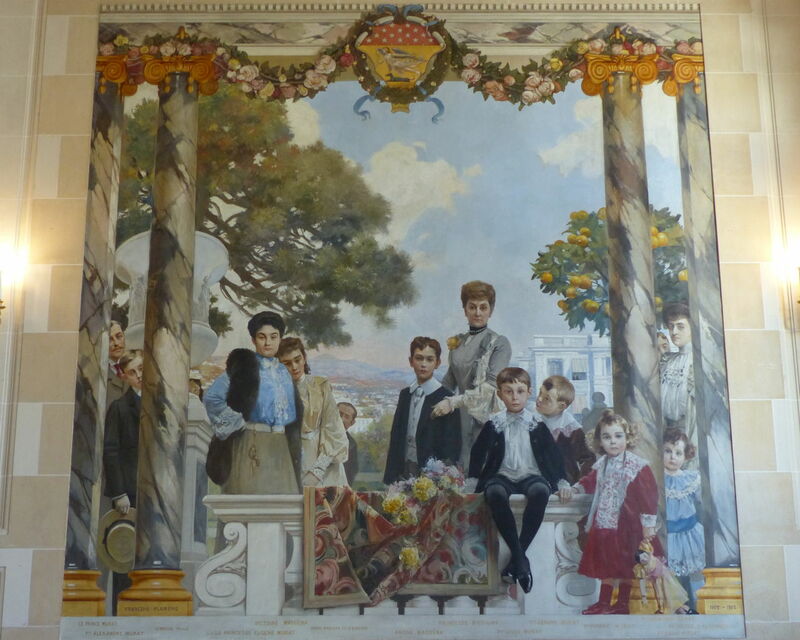 In 1902-03, Flameng painted the walls of the Masséna family’s palatial villa in Nice. They were descendants of André Masséna, the son of a shopkeeper in Nice who rose to become one of Napoleon’s Marshalls and the first Duc de Rivoli and Prince d’Essling. This painting shows The Masséna Family Entertaining Princess d’Essling, in a wonderful trompe l’oeuil. Their names are carefully inscribed at its foot. 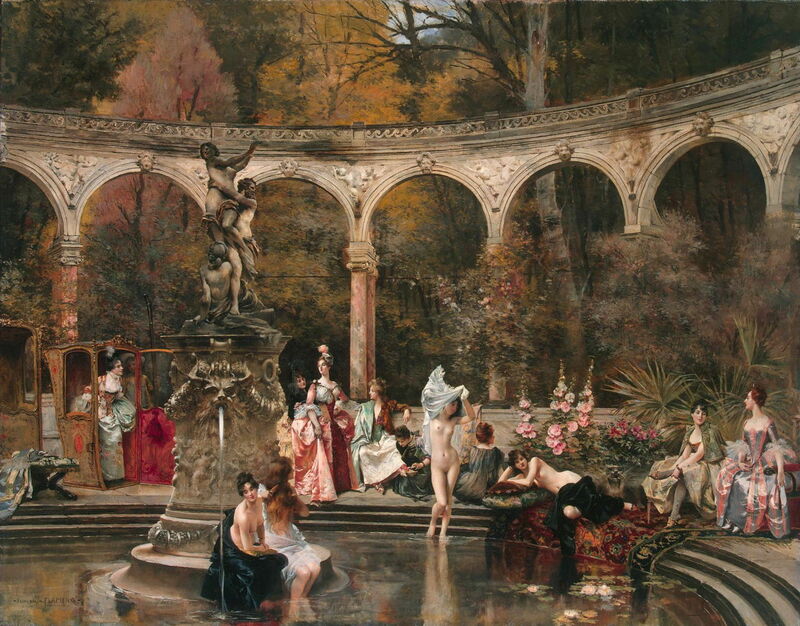 François Flameng (1856–1923), Bathing of Court Ladies in the 18th Century (1888), oil on canvas, Hermitage Museum Государственный Эрмитаж, Saint Petersburg, Russia. Wikimedia Commons. 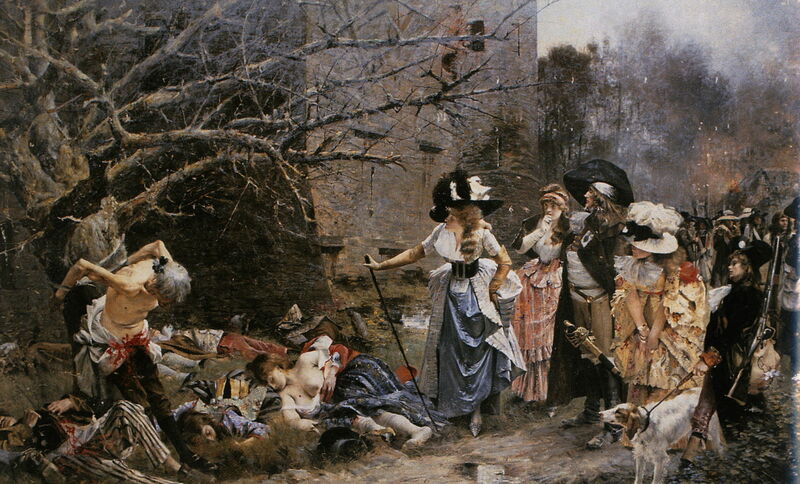 During the last quarter of the nineteenth century, Flameng was also a history painter of renown. Some of his works, such as this scene of Bathing of Court Ladies in the 18th Century painted in 1888, were clearly intended to appeal to the husbands who paid him so lavishly for painting their wives. François Flameng (1856–1923), Jean Grolier in the House of Aldus Manutius (1894), media and dimensions not known, Private collection. Wikimedia Commons. Other paintings explored the world of the rich and cultured. 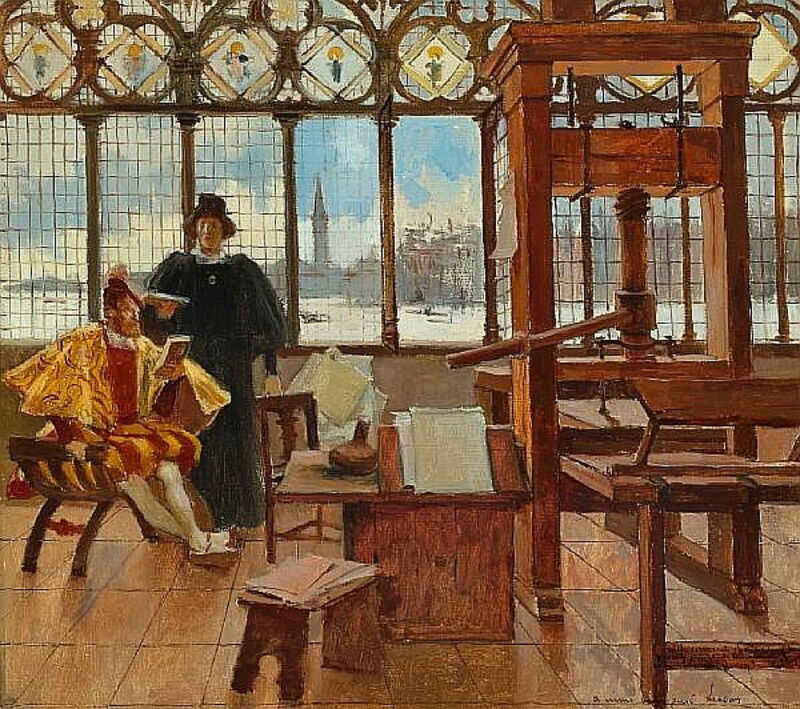 Jean Grolier in the House of Aldus Manutius from 1894 shows Jean Grolier de Servières, Treasurer-General of France and one of the most famous bibliophiles in history, with Aldus Manutius the Venetian printer and publisher, in about 1511. Sadly, although the two men did meet, it’s now thought that took place in Milan, where Manutius didn’t have his press, nor was there such a picturesque background. Nevertheless it makes a fine painting. 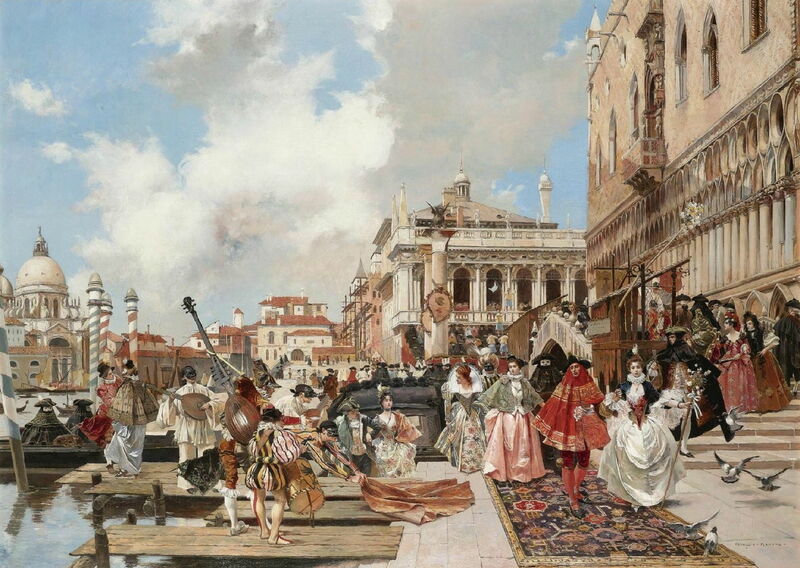 François Flameng (1856–1923), The Carnival, Venice (date not known), further details not known. Wikimedia Commons. Flameng also celebrated The Carnival, Venice in this highly detailed and undated view. 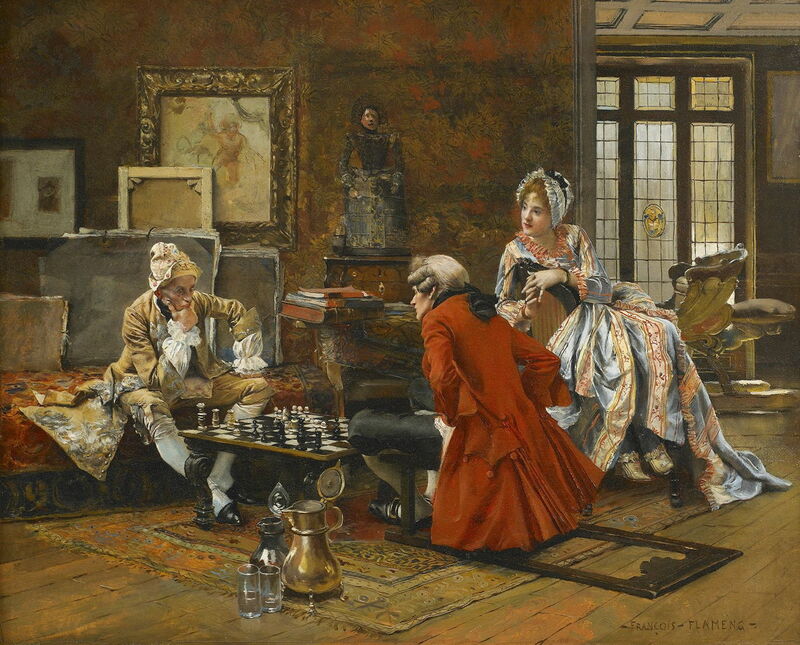 François Flameng (1856–1923), Chess Game (date not known), further details not known. Wikimedia Commons. His undated Chess Game would surely have appealed to a similar audience. François Flameng (1856–1923), Concert at Versailles (date not known), further details not known. Wikimedia Commons. Life at the royal palaces of France was also fair game, here a Concert at Versailles. François Flameng (1856–1923), Parisians Arriving at Versailles (date not known), further details not known. Wikimedia Commons. 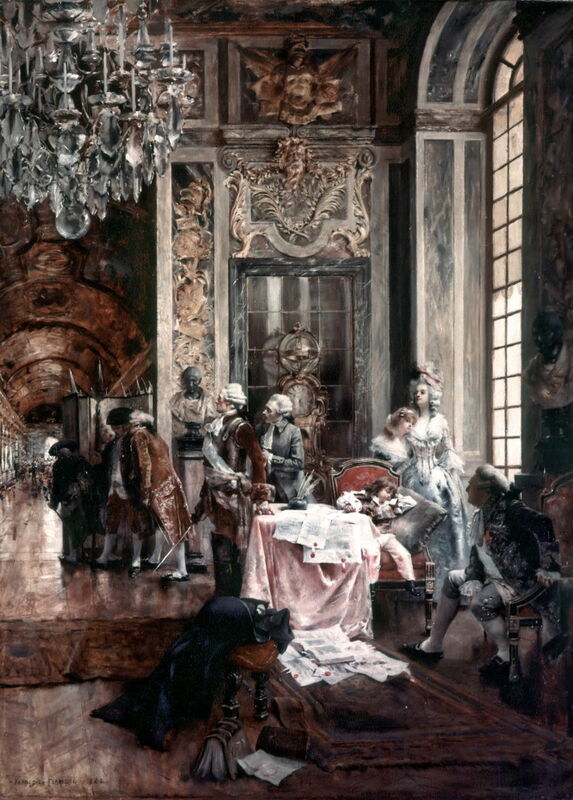 Remaining at the same palace, he painted events at court, such as that of Parisians Arriving at Versailles. 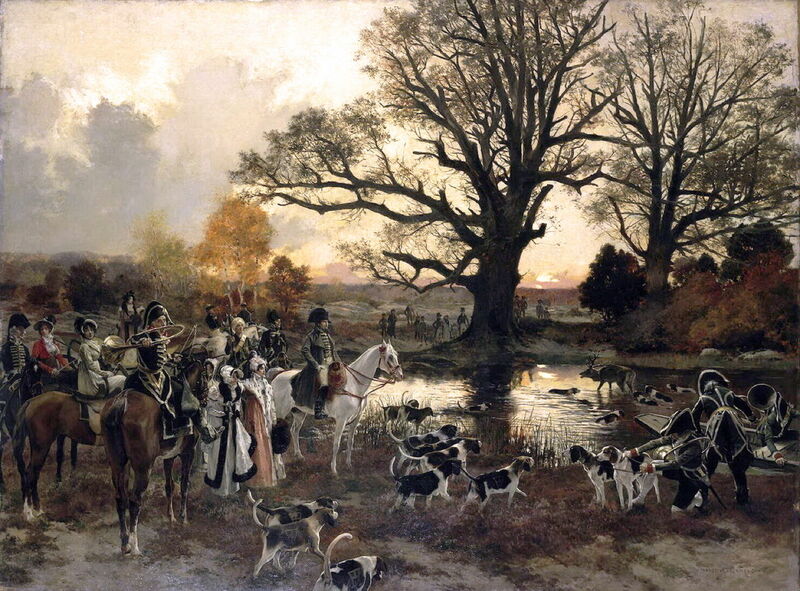 Among his paintings showing the Napoleonic period, one of the most striking is this scene of Napoleon Hunting in the Forest of Fontainebleau, in which the pack is closing in on a cornered stag as the sun sets. François Flameng (1856–1923), Île Pointeaux (date not known), further details not known. Wikimedia Commons. I’ve been unable to locate the scene shown in Flameng’s undated painting of Île Pointeaux, but this appears to be set on the bank of a river, perhaps in Paris. 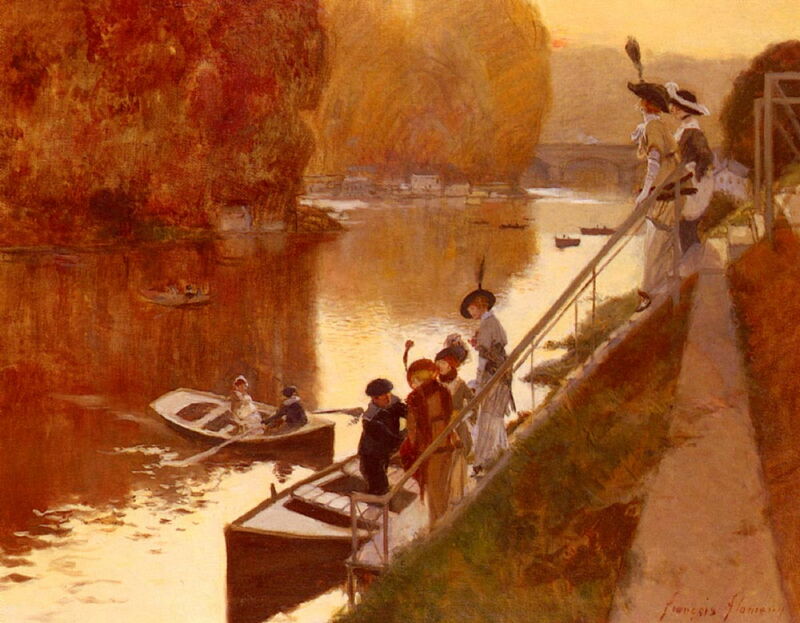 The ladies descending the steps to board a boat look as if they might sit for a portrait too. 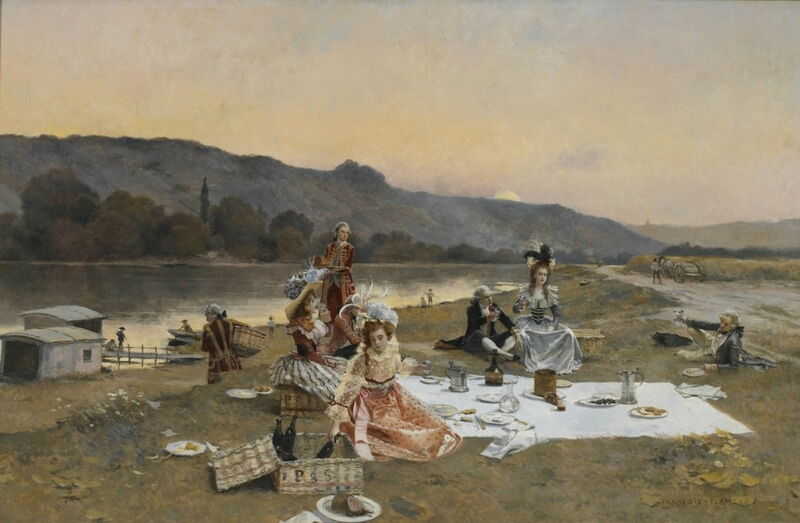 François Flameng (1856–1923), Picnic (date not known), further details not known. Wikimedia Commons. In this view of a Picnic, Flameng returns to an earlier era, probably the eighteenth century, when the biggest question is whether the servants brought the right wine. But among Flameng’s succession of depictions of the rich at play, there is an odd man out, a work both visually striking and profoundly controversial. 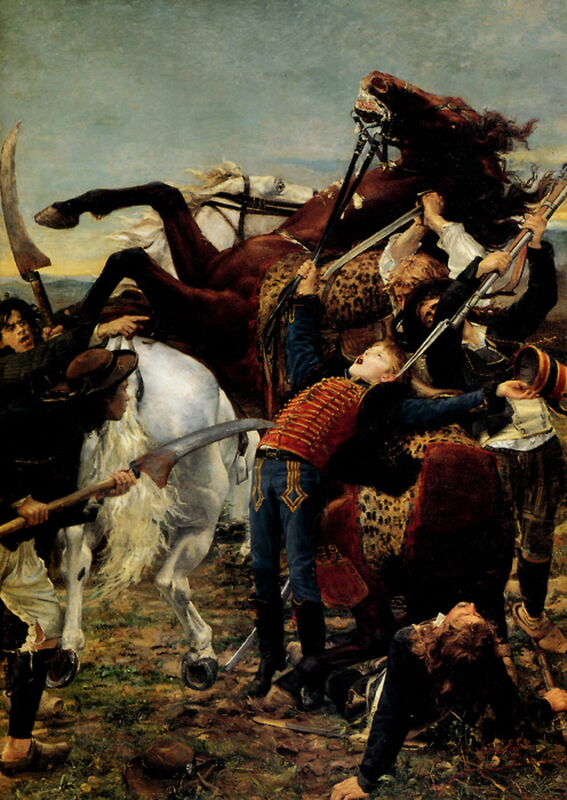 François Flameng (1856–1923), Massacre of Machecoul (1884), media and dimensions not known, Musée d’art et d’histoire de Cholet, Cholet, France. Wikimedia Commons. 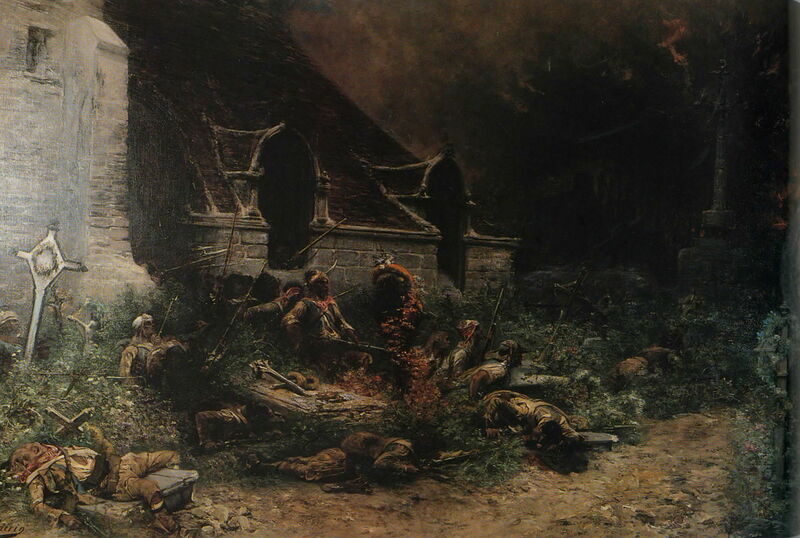 Flameng painted Massacre of Machecoul in 1884. At the right is a group of fashionably-dressed gun-toting (and sword-bearing) gentry out for a walk. At the left are the raped and mutilated bodies of women and men. This scene shows the opening horror of one of the darkest episodes in recent French history: the slaughter of French civilians in the Vendée region of France which took place from 1793. Some now claim that this amounted to an act of genocide, although that is hotly disputed. Flameng’s gruesome image is almost a pendant to a painting by one of his friends, Georges Clairin. Clairin’s undated painting of The Living Defend Their Dead. War in the Vendée shows a slightly earlier scene from the same royalist uprising, in which a small group of French rebels is taking shelter in the graveyard of a country church, on the lookout for the enemy. Just a few years earlier, a different episode had been painted by Jean-Joseph Weerts in The Death of Barra (1880). This shows a romanticised story which had started with a young boy who was killed by a gang of horse thieves during the same uprising in the Vendée in 1793. During the French Revolution, this was turned into propaganda by false claims that the boy had been killed because he had stood up for the French Republican movement against the Royalists. This wasn’t the last time that François Flameng was to paint the victims of war, for in 1914, he became one of the leading war artists to cover the Great War in France, alongside his friend John Singer Sargent. I will look at a few of his paintings from 1914-1919 tomorrow. Posted in General, Life, Painting and tagged Flameng, Helleu, painting, Sargent, war artist. Bookmark the permalink.